Peak Positioning Technologies (PKK.C) (PKKFF) released an updated investor presentation and news release this morning following its attendance at the GCFF conference in Vancouver. I don't have enough information to release a full blown article but I thought I would share some quick thoughts. I plan to update it once the company has released Q4 and provided official guidance. Peak has pivoted once again into more lucrative businesses with the introduction of Asia Synergy Data Solutions (ASDS) and a proposed financial institution Asia Synergy Financial Capital (ASFC). ASDS teaming up with Cubeler sounds a lot like what LongKey would have been, except with the backing of ZHWY Enterprises. 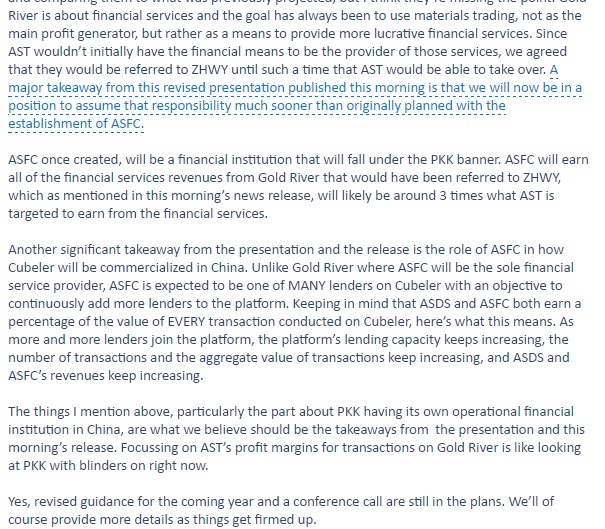 ASFC is the method for Peak to try to increase its margins as it looks to bring the lending component of the Gold River platform in-house. With these pivots which will obviously be very good for the long-term, it sounds like there will be some short term "pain" in that Q4 revenue probably won't come in as expected. I'm not too disturbed by this. We know from a prior news release that PKK will be recording at least $50 million in revenue for 2016. Going from $0 to $50 million in revenue in a year is still a monumental accomplishment, even if it's a little less of an accomplishment than going from $0 to $100 million a year. 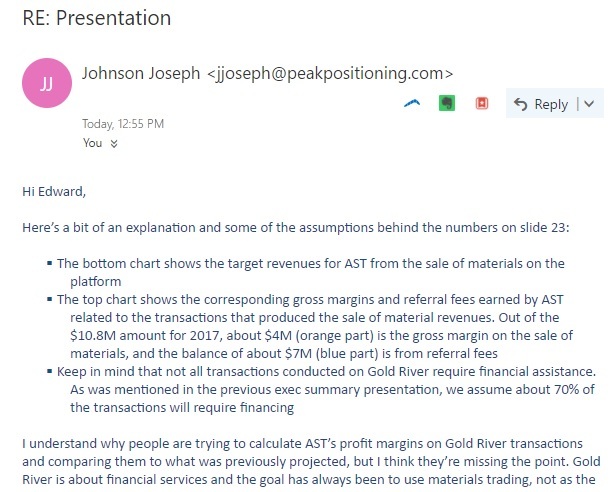 On page 23 of the presentation, there are two numbers referenced for AST in 2017. $503 million in revenue and a $10.8 million number which isn't clear if that's gross margin or EBITDA or something else. Assuming that is the case, this would be below previous guidance of a 3-5% EBITDA margin on $550 million in revenue stated in the Q3 news release. Offsetting that is the $1.4 million in projected revenue for ASDS in 2017 and the unknown benefit of ASFC assuming it goes live as planned some time in 2017. Based on this, it looks like PKK will take a little longer to get to my $0.50 target as first planned, at least justifiable from financial ratios. There always remains the possibility that speculative investors will like this new business and bid up the stock to very high valuations in the near term. But by 2019 revenue for AST and ASDS is expected to be a combined $887 million. It's difficult to project such a fast growing business two years out, but if these numbers do in fact come true with $50M in EBITDA or greater, a $0.50 stock price should be more than justified. There was a small sell-off this morning to 14 cents after the warning about the negative impact on the near-term numbers and some of the ambiguity around these projections. Buying has picked back up and the stock is trading at 15 cents, down a penny. I think it is reasonable to assume that Q4 will be disappointing relative to previous guidance (but still great compared to where the company was in 2015). However, 2017 guidance could go in either direction depending on how quickly PKK can get ASFC up and running. For now, I think we should assume revenue just slightly over $500M and margin/EBITDA slightly over $10M, but even that should support the stock price where it is now. With this pivot there is no guarantee of success for ASFC or even that it will get off that ground. But that's why PKK is trading at a fully diluted market cap of $100M and not much higher. I remain confident of my heavy investment in PKK, other investors can figure out for themselves if they share that same level of confidence. A few weeks ago, I presented a $5.00 target on First Global Data (FGBDF) (FGD.V) by the end of 2018. This target assumed that the company can achieve 5 million users at an average EBITDA per user of $26 by that time. It was based off of a 15x EBITDA multiple, 400 million fully diluted shares and $52 million in cash received from the assumption that all warrants and options would be exercised. Presented below is a chart that displays a matrix of potential stock prices based on a range of 100,000 to 100 million users and an average EBITDA per user from $10 to $90. FGD's CEO Andre Itwaru has gone on record to state that based off of one million users, he thinks FGD can achieve $146.1 million in revenue and $93.5 million in EBITDA (page 11 of the January corporate presentation). This is a $146 average revenue per user (ARPU) and a 64% margin, leading to a $93.50 average EBITDA per user. Keep in mind this assumes a 50-50 split in revenue between FGD and its partners, so gross ARPU would be $292. Until I see ARPU figures proving otherwise, I personally think that these numbers will be a challenge to meet. That's why my chart ranges as low a $10 EBITDA per user and up to the company's estimate of $90. Assuming a 64% margin, a $25 average EBITDA per user equates to a $39 ARPU. We know that based on the Google Play install stats that VPayQwik, FGD's app in partnership with Vijaya Bank, is over 100,000 users. I estimate the installs to be at least 130,000. Keep in mind that this is only for India. VPayQwik was launched in mid-September 2016 so the revenue and profits disclosed by FGD for the first nine months of the year was largely based off of the company's North American remittance business. FGD hasn't disclosed how many users it has in North America, but we can assume this is substantial and growing based on the Alexa traffic stats for FGD's business site firstglobalmoney.com. So how many users does FGD have? Something well over 100,000 and growing. If FGD has 500,000 users at an average ARPU of $39 and average EBITDA per user of $25, that leads to a $0.60 stock price. Of course, at this early stage FGD won't be valued based solely on current business metrics, but the reasonable expectation of growth since the Indian and North American businesses are robust and the various partnerships announced over the last several months will be deployed soon enough. I have already stated my belief that the company can achieve 5 million users in a timeline of a little over a year and that leads to substantial upside even if the ARPU comes in at around 25-30% of the company's expectation. Let's look at the long term upside. Let's say that FGD eventually does achieve 100 million users. This could take several years, but it is well within the realm of possibility upon continued execution and deployment of partnerships. Let's say that of those 100 million users, a lot of them are low value and that drags down the average ARPU. Given FGD's focus on the developing world that may be a fair assumption. Even if the annual EBITDA per user is a mere $10, the stock price would be $37.63 based off of a 15x EBITDA multiple. If the company is extremely successful and somehow manages to pull off a $90 EBITDA per user on this large base of 100 million users, the stock price would be $337.63 based off of a 15x EBITDA multiple. I don't know if FGD will ever get to these crazy prices, or if it will be bought out well before then or if I would even hold that long. But at $0.80 this isn't a concern yet. FGD has a ton of upside from here as my valuation matrix indicates.